Download "LPL Insurance associates. 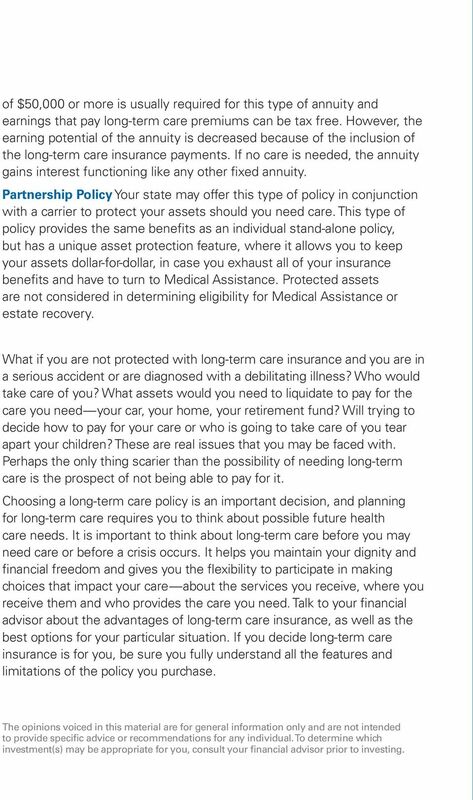 Guide to Long-Term Care Insurance"
2 Long-term care insurance can be confusing, no matter who you are, especially if you don t know who to turn to for expert advice. The decision to purchase long-term care insurance is very important and one you shouldn t rush into without proper research. Because you cannot purchase long-term care insurance when you need to use it, you must make the decision about obtaining it ahead of time. You work hard and save money your entire life to ensure you have enough funds to secure your retirement, as well as pass on assets to your heirs. If you were to have a long-term care need, your savings could be depleted very quickly without a proper long-term care policy in place. Most people will need assistance with activities of daily living at some point in their lives, whether due to aging, injury, illness or disability. Regardless of the type of care or the setting, care can be very expensive and can quickly drain your life savings. Whether you need help now or are exploring future options for yourself or a loved one, this brochure can assist you. What is long-term care? Long-term care is a variety of services and support to meet health or personal care needs over an extended period of time. Most long-term care is non-skilled personal care assistance helping perform everyday activities of daily living, such as bathing and dressing. Long-term care can be: Skilled nursing care Custodial care to help with the activities of daily living Respite services: for caregivers who need a break from daily responsibilities Long-term care includes medical and non-medical services to people who have a chronic illness, disability or a cognitive impairment, such as Alzheimer s disease, or simply as part of the normal aging process. Though older people use the most long-term care services, a young or middleaged person who has been in an accident or suffered a debilitating illness might also need long-term care. It is important to remember that you may need long-term care at any age. 40% of people currently receiving longterm care are adults 18 to 64 years old. Long-term care insurance can help protect your assets, help maintain your financial freedom and give you the options necessary to receive quality long-term care and services. Neither Medicare, nor Medicare supplemental coverage, also known as Medigap insurance, nor standard health insurance policies cover long-term care. You have limited choices to pay for long-term care: Pay out of pocket Medicaid (welfare): Must have little or no assets to qualify and only covers Nursing Home Care Medicare: Only covers a portion of the first 100 days for skilled care; most care needed is non-skilled Long-term care insurance The cost of long term care insurance varies widely, depending on the level of services you need and the length of time you need care. But no matter what your need may be, whether it is a nursing home, an assisted living facility or home care, all could potentially exhaust your savings account. On average, one year in a nursing home or 24-hour home care can cost more than $66,000 today. In such states as New York, the costs can run as high as $115,340. With costs increasing at about 4% per year, this care could cost $150,000 to $250,000 per year in 20 or 30 years. Work, distance and other responsibilities may make it difficult for family and friends to do as much as they d like. By covering personal care assistance from licensed health care and home care professionals, longterm care insurance relieves you of being dependent on others or be a burden to your children. So, the time you spend together can be more rewarding and enjoyable. 4 of $50,000 or more is usually required for this type of annuity and earnings that pay long-term care premiums can be tax free. However, the earning potential of the annuity is decreased because of the inclusion of the long-term care insurance payments. If no care is needed, the annuity gains interest functioning like any other fixed annuity. Partnership Policy Your state may offer this type of policy in conjunction with a carrier to protect your assets should you need care. This type of policy provides the same benefits as an individual stand-alone policy, but has a unique asset protection feature, where it allows you to keep your assets dollar-for-dollar, in case you exhaust all of your insurance benefits and have to turn to Medical Assistance. Protected assets are not considered in determining eligibility for Medical Assistance or estate recovery. What if you are not protected with long-term care insurance and you are in a serious accident or are diagnosed with a debilitating illness? Who would take care of you? What assets would you need to liquidate to pay for the care you need your car, your home, your retirement fund? Will trying to decide how to pay for your care or who is going to take care of you tear apart your children? These are real issues that you may be faced with. Perhaps the only thing scarier than the possibility of needing long-term care is the prospect of not being able to pay for it. Choosing a long-term care policy is an important decision, and planning for long-term care requires you to think about possible future health care needs. It is important to think about long-term care before you may need care or before a crisis occurs. It helps you maintain your dignity and financial freedom and gives you the flexibility to participate in making choices that impact your care about the services you receive, where you receive them and who provides the care you need. Talk to your financial advisor about the advantages of long-term care insurance, as well as the best options for your particular situation. If you decide long-term care insurance is for you, be sure you fully understand all the features and limitations of the policy you purchase. The opinions voiced in this material are for general information only and are not intended to provide specific advice or recommendations for any individual. To determine which investment(s) may be appropriate for you, consult your financial advisor prior to investing. caring the part of your retirement plan. Help your clients manage chronic illness costs with life insurance. Chronic Illness Rider Optional Living Benefits Producer Guide Life insurance can leave a legacy. It can provide a living benefit too. 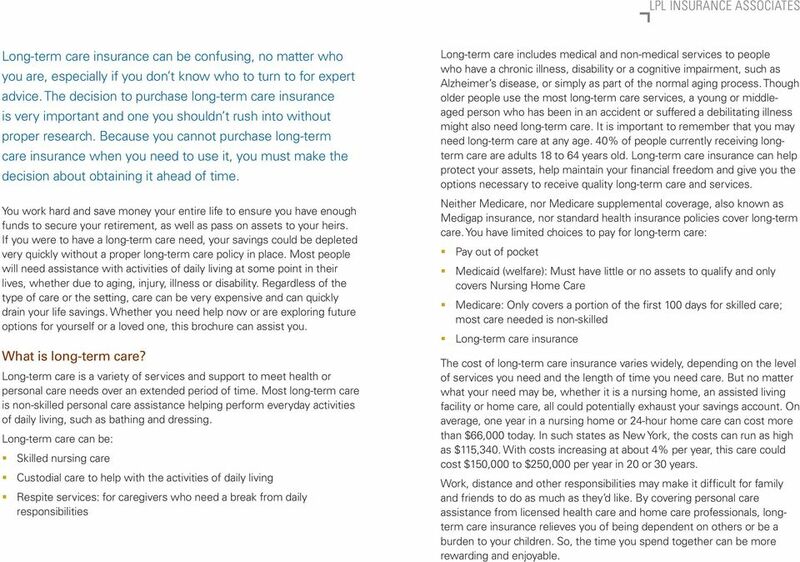 Long-Term Care: Don t Wait to Prepare for the Long Term. What is Long-term care? What are My Options? Life Insurance You Don t Have to Die to Use. 8532 QOL REV0615. Policies issued by American General Life Insurance Company (AGL). A solution offering much more than life insurance.
! Thursday, August 6 2015 WRM# 15-29 The WRMarketplace is created exclusively for AALU Members by the AALU staff and Greenberg Traurig, one of the nation s leading tax and wealth management law firms. CONSUMER GUIDE PROTECTION LONG-TERM CARE RIDER An Accelerated Death Benefit Rider Protection when you need it most ICC13 IM4125CG 01/14 THE PURPOSE OF THIS COMMUNICATION IS THE SOLICITATION OF INSURANCE. QoL Flex Term QoL1 8532 FT REV0815 Important Questions... Ask yourself these three very important questions 1. How much life insurance do I need to protect my family? 2. How much life insurance can I afford? THE ABC s. of Long-Term Care. 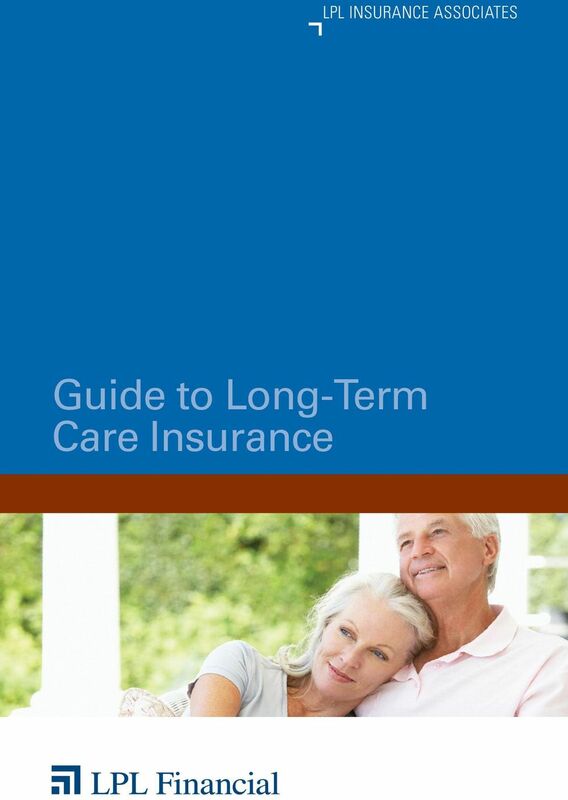 A guide to help you and your loved ones plan for long-term health care. 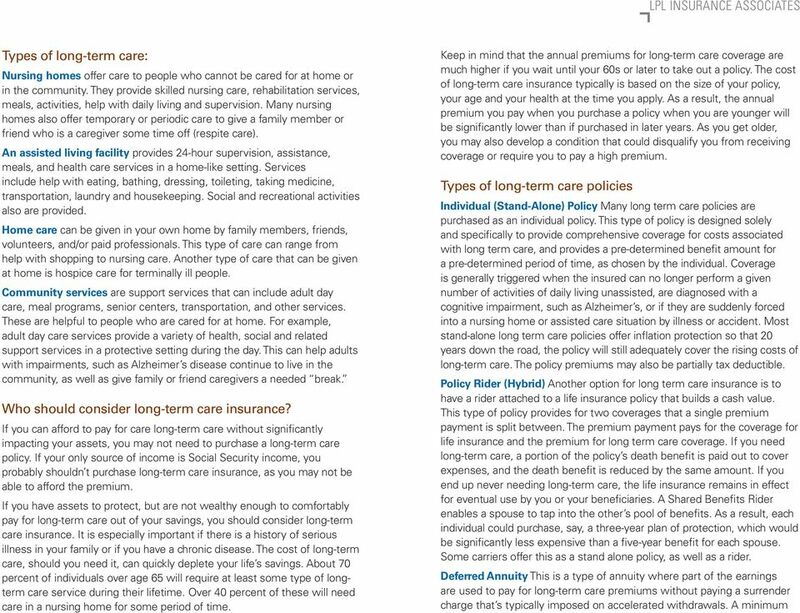 What types of benefits are available in a long term care policy or certificate? What is long term care? Long term care encompasses a wide range of medical, personal and social services. People may need this care if they suffer from prolonged illness, disability or cognitive impairment.